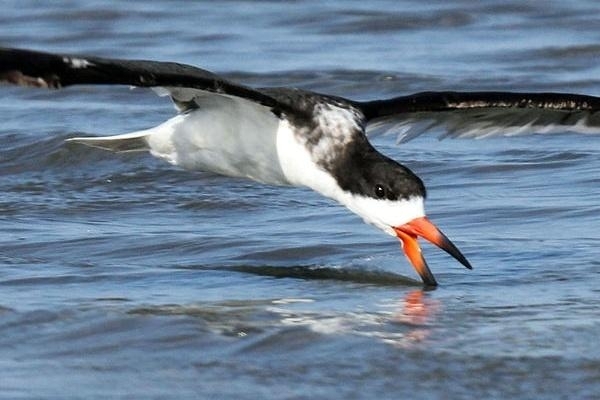 The Black Skimmer has an unusual way to fish. 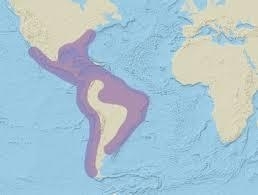 It has a huge lower bill that is not like other birds; it doesn’t move. 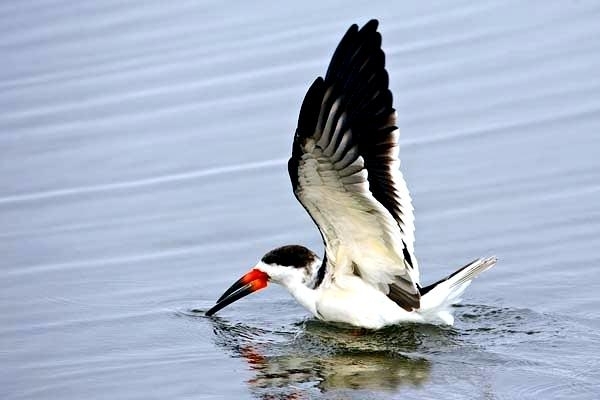 The Black Skimmer uses this lower bill to plows or “skim” through the water until it strikes a fish, then the head snaps down so that the upper bill can grasp the fish. 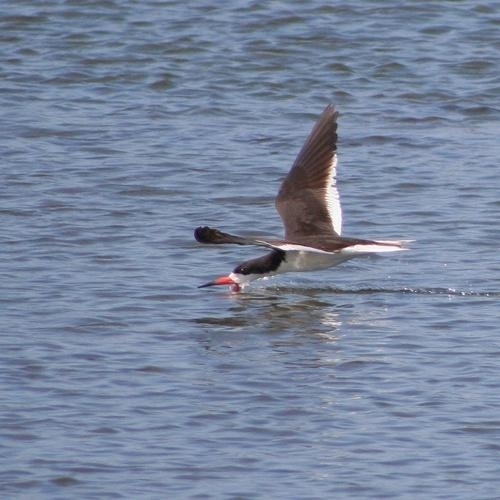 The Skimmer then drags the fish from the water and swallows it head first while still in flight or takes it back to the nest. 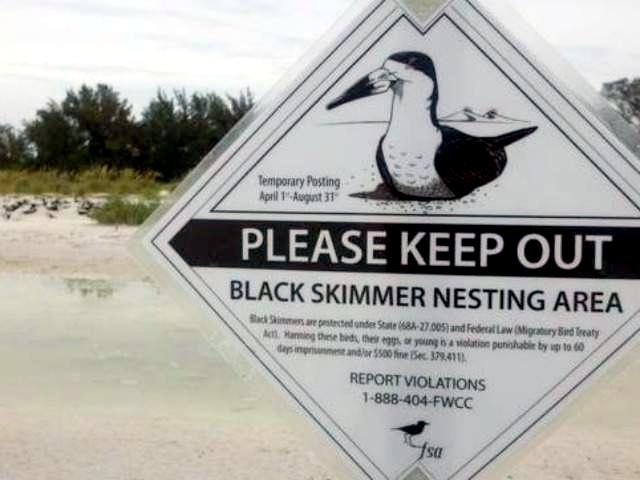 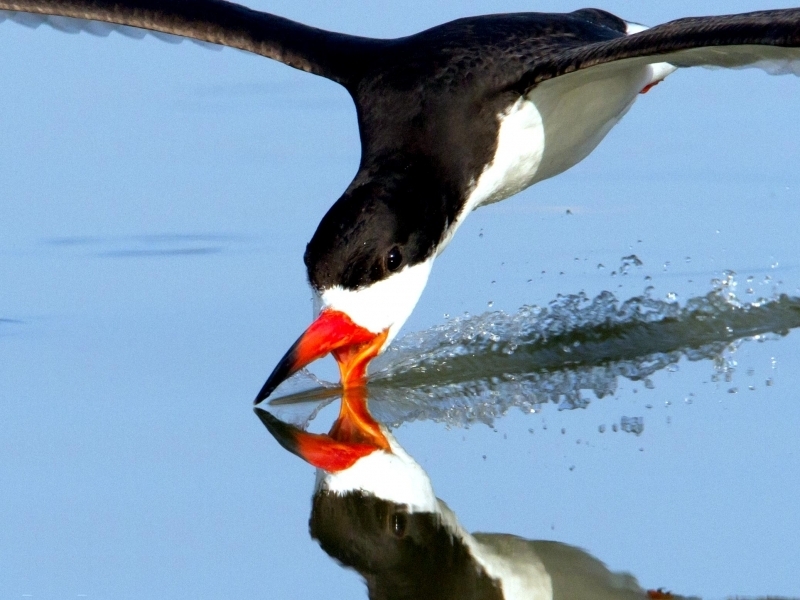 The Black Skimmer is the only Skimmer found in North & South America. 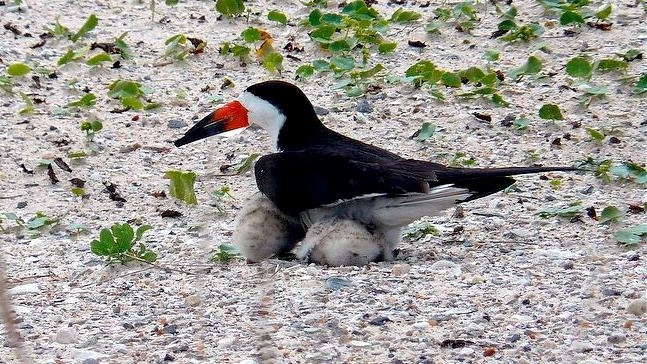 It is a black & white tern and has a massive red bill with a black tip. 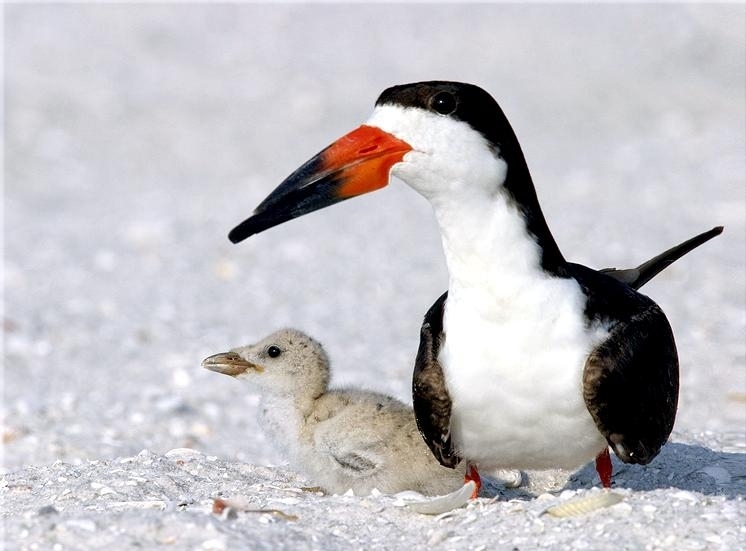 Males are bigger and have larger bills than the females. 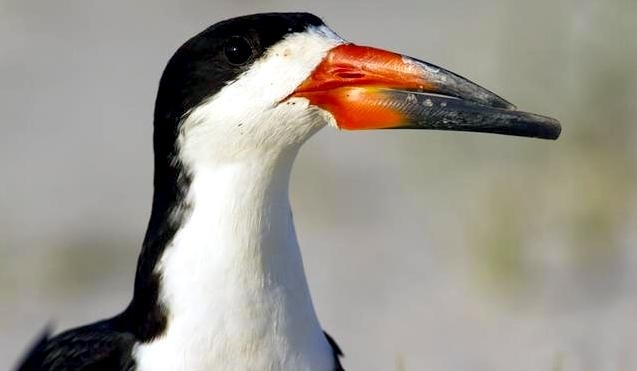 The lower bill is longer than the upper bill which makes it looks as if it has a big head. 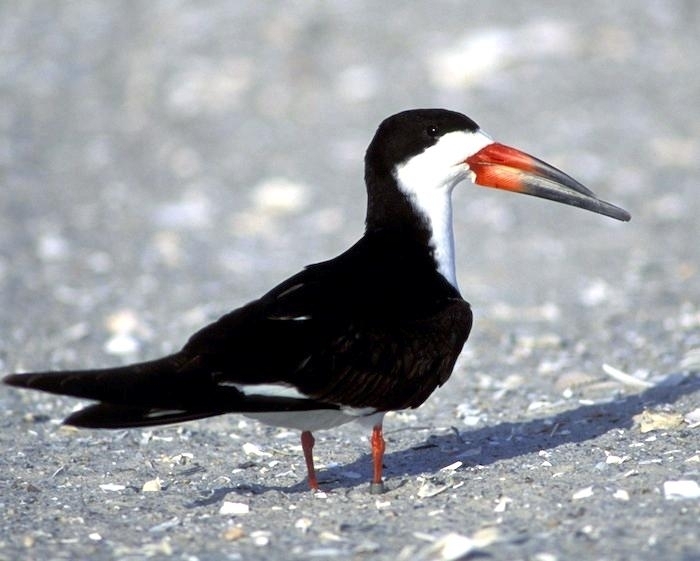 No other bird has a lower mandible longer than the upper bill. 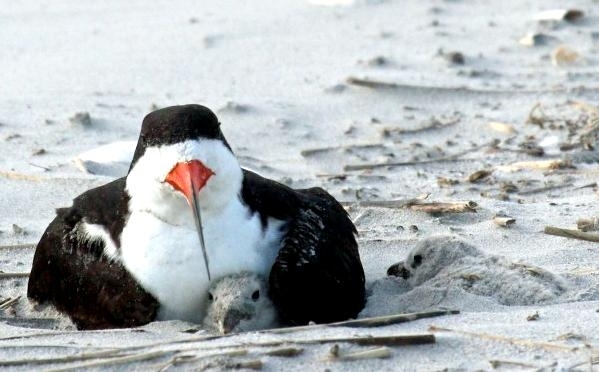 It has a black crown and white forehead and under parts. 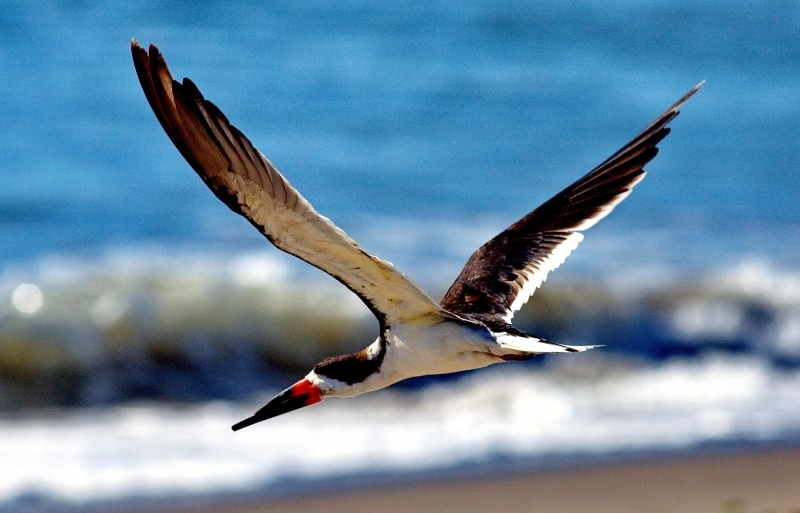 Its long pointed wings are longer than its short tail. 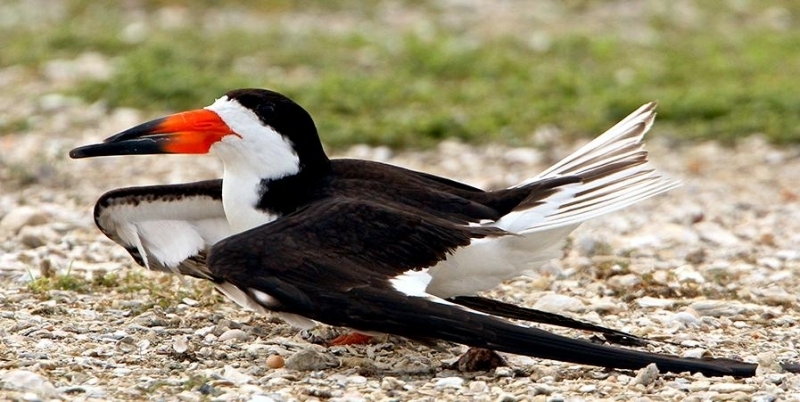 The Black Skimmer has legs and feet that are red-orange and the feet are webbed. 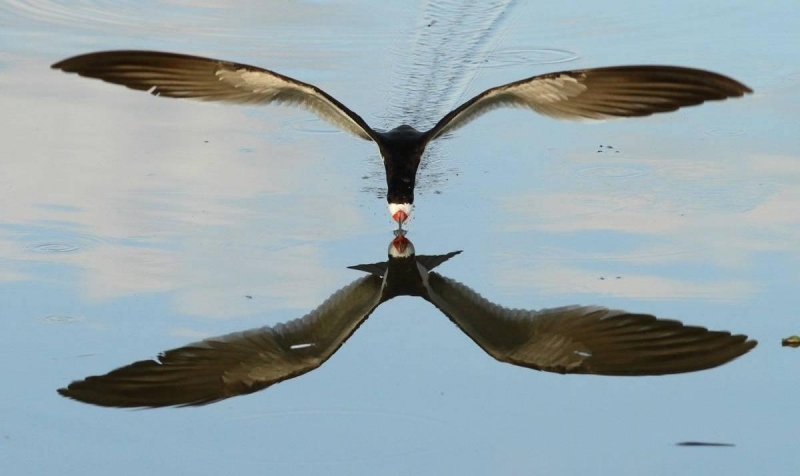 The pupil of the eye is a vertical slit which helps to cut down on the glare of the water during the day and also helps with foraging at night. 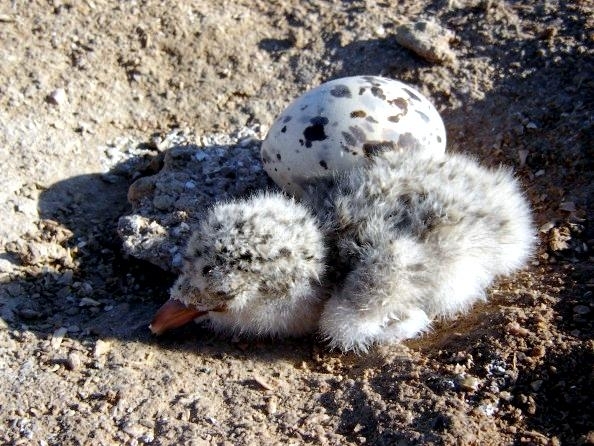 A juvenile is mottled gray-brown with white scaling above the legs. 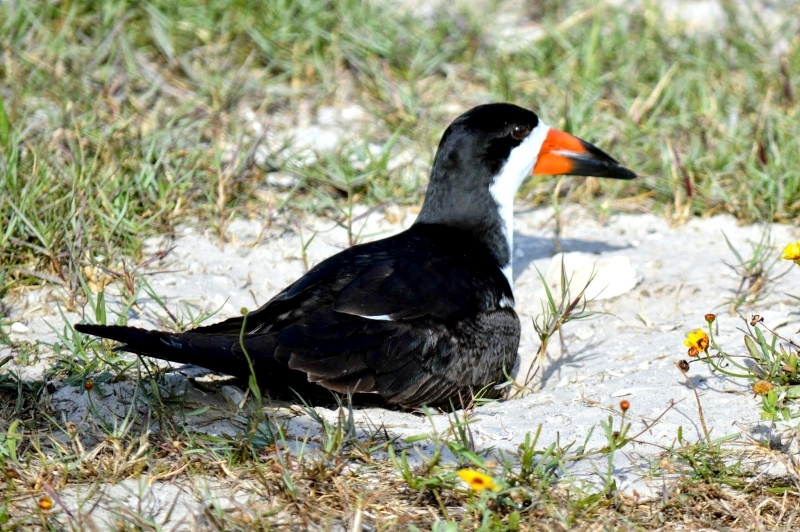 The forehead and nape of the neck is white; the back of the neck is dark brown. 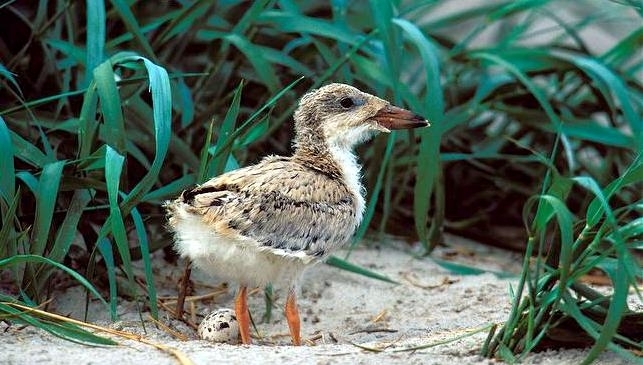 The juvenile’s legs are pale orange and there is black feathering on the back and wings. 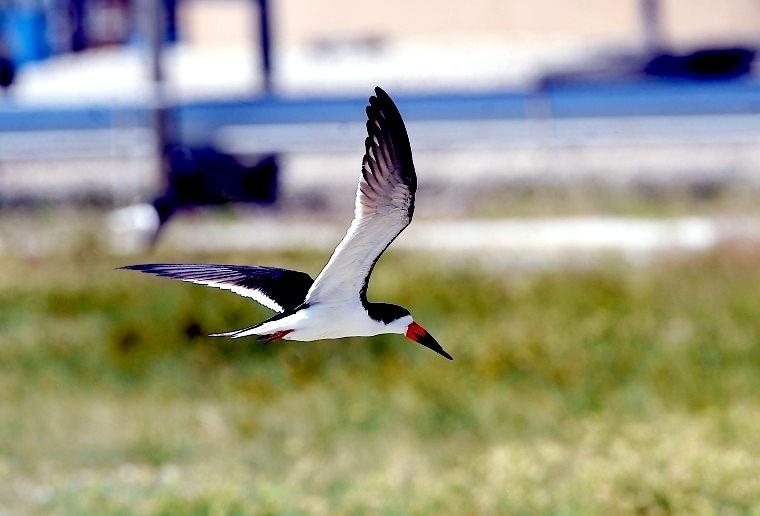 Black Skimmers are found along coasts, rivers and waterways of the southern United States and in some parts of the Caribbean and South America. 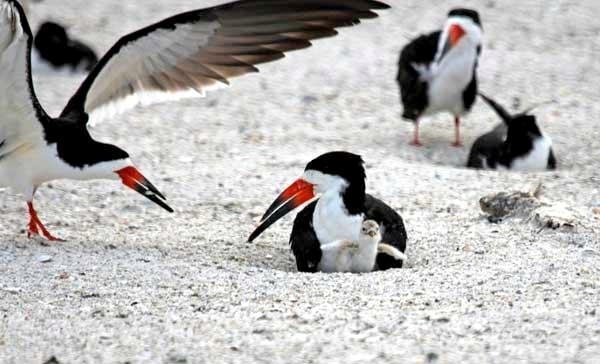 They nest with other birds on sand bars & barrier beaches. 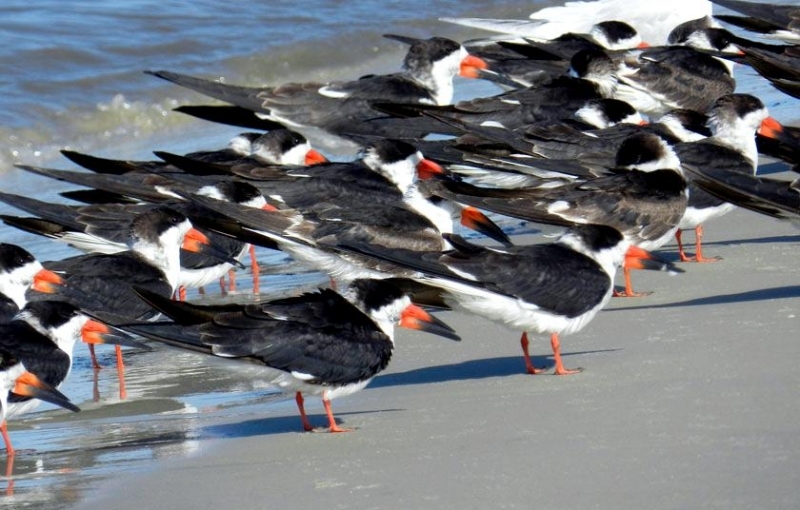 They spend much time loafing gregariously on sandbars in the rivers, coasts and lagoons they frequent. 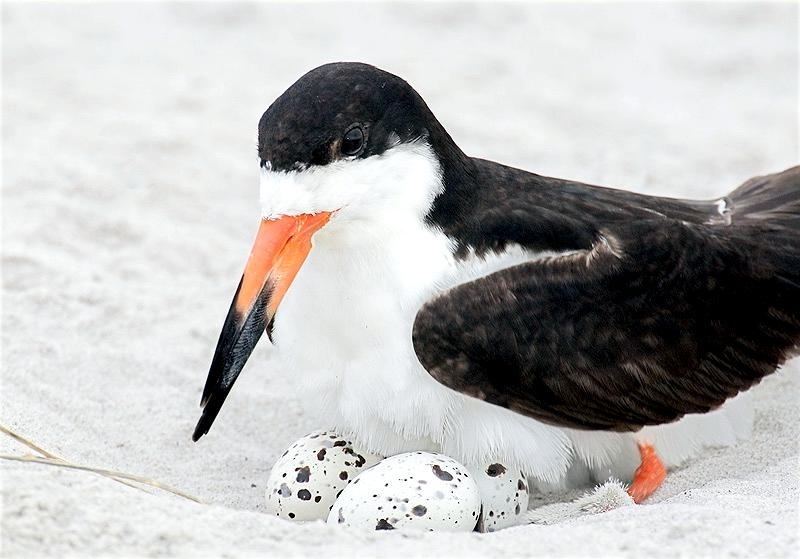 The Black Skimmer will head south during the winter and form colonies. 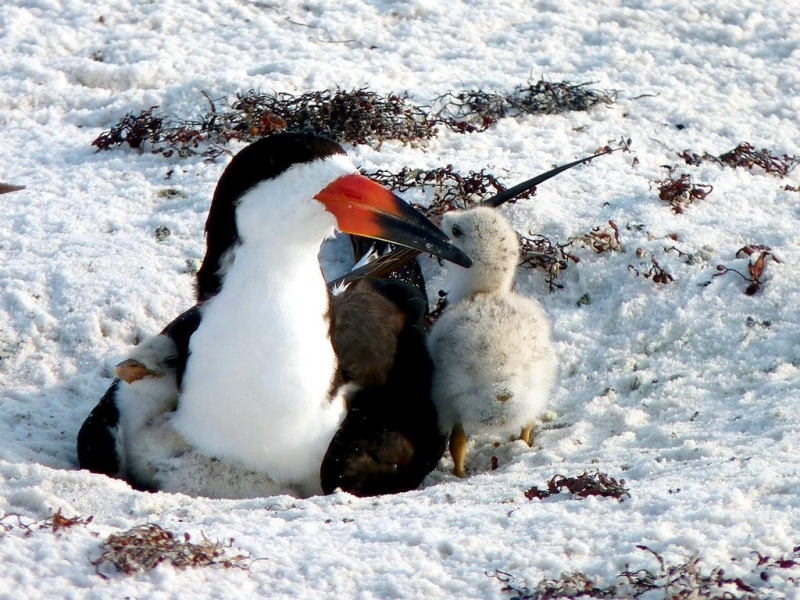 The colony size varies from a few birds to colonies of thousands of pairs. 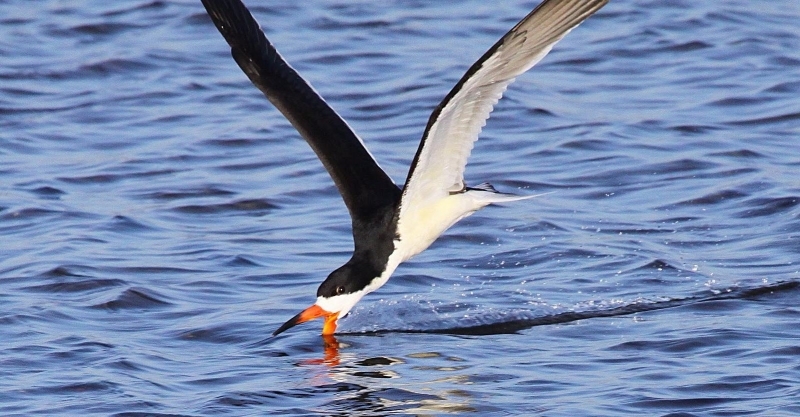 The Black Skimmer rarely swims or dives, instead it uses its sense of touch to find its prey. 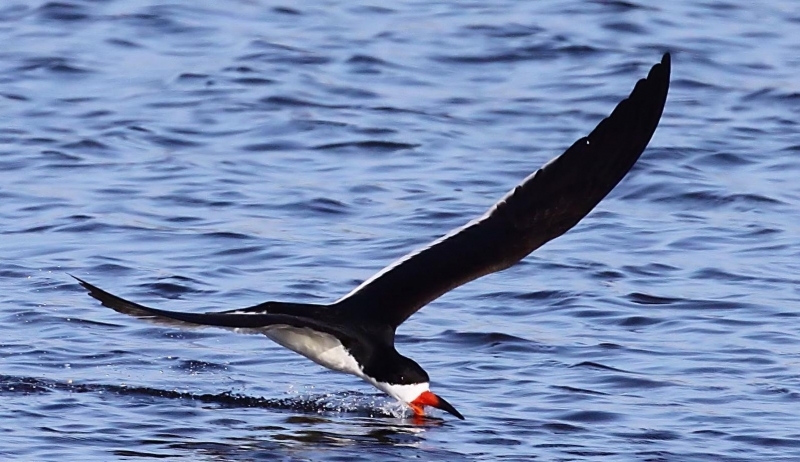 It flies fast above the water with its lower beak open and just skimming the water (thus its name). 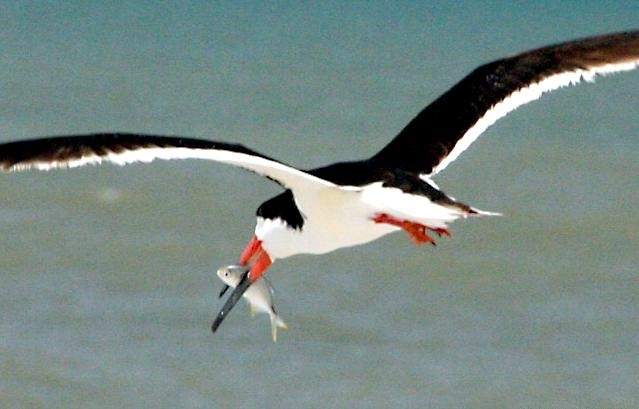 It skims along until it strikes a small fish or crustacean; the upper bill snaps shut and traps the prey. 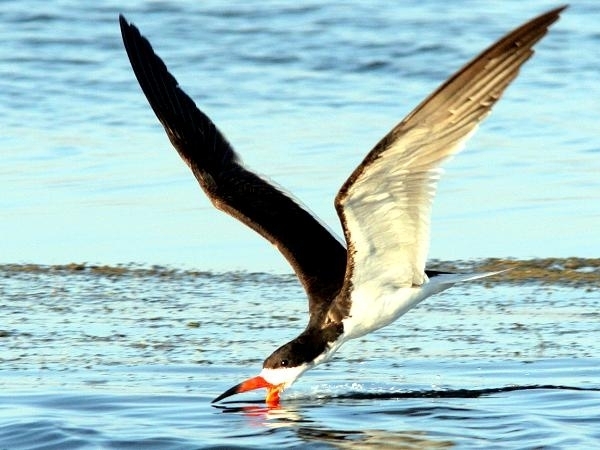 It forages for food at night, early in the morning and towards dusk when more fish are near the surface of the water. 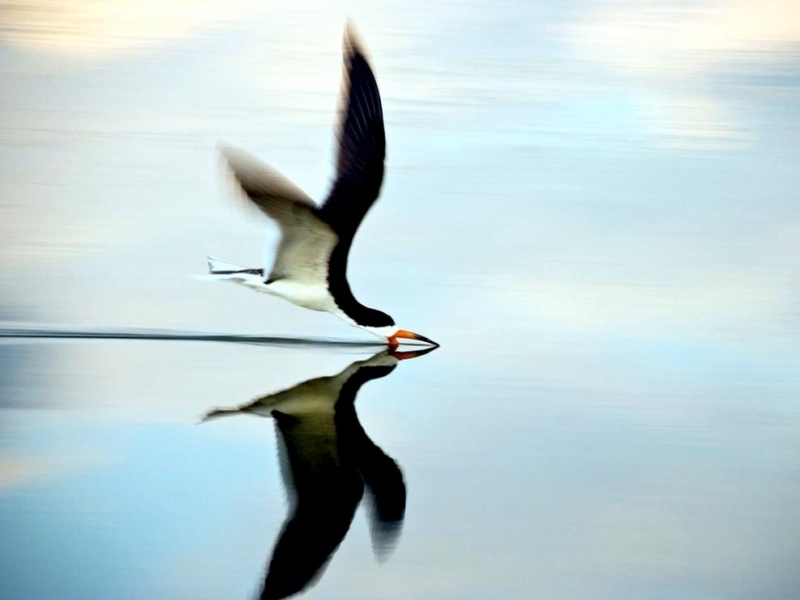 It can only feed in calm waters such as lagoons, inshore waters and rivers. 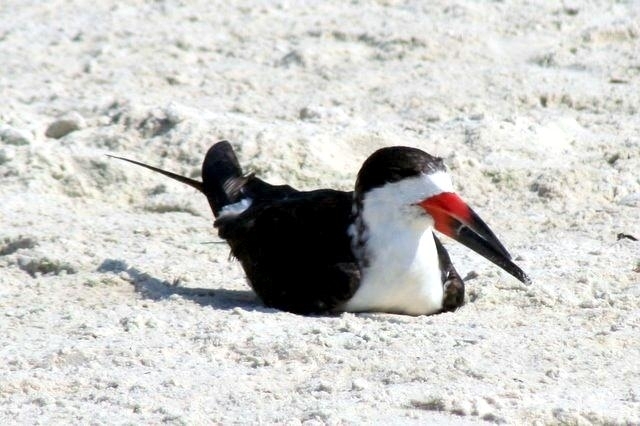 The Black Skimmer is a social bird and hangs out with other Black Skimmers during the daytime. 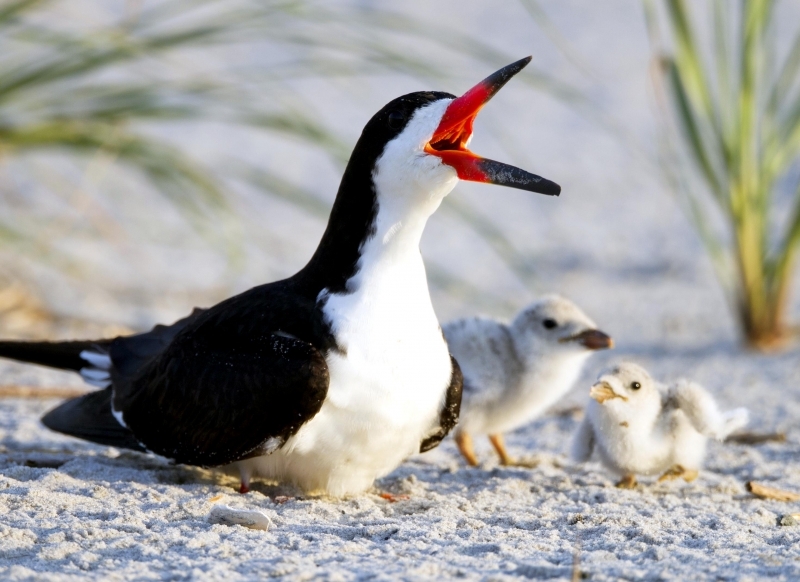 You will be able to hear them calling “auk” or a soft “keow, keow, keow”. 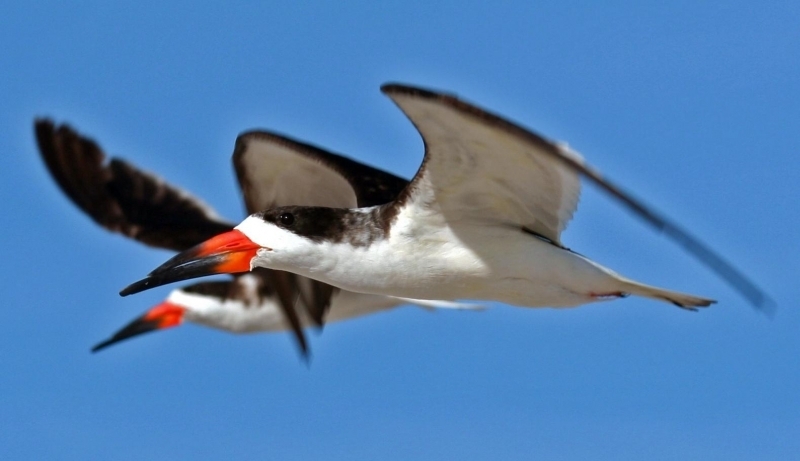 These seabirds are graceful fliers and sometimes synchronize their movements by twisting and turning and circling together in the air. 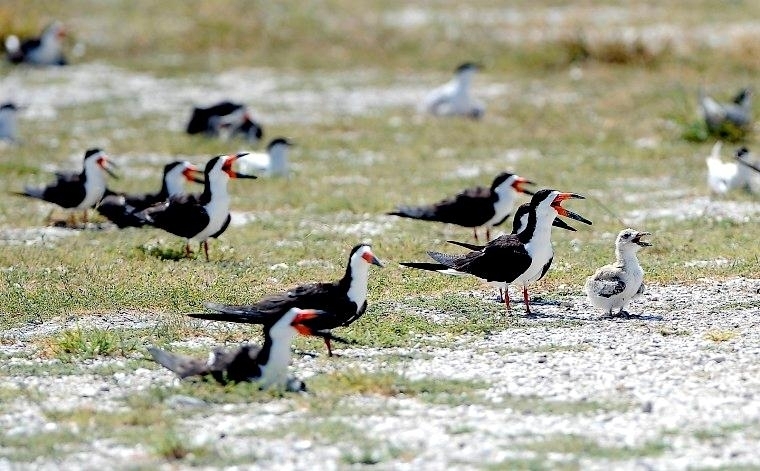 They show aggressive behavior by “barking” like a dog and posturing. 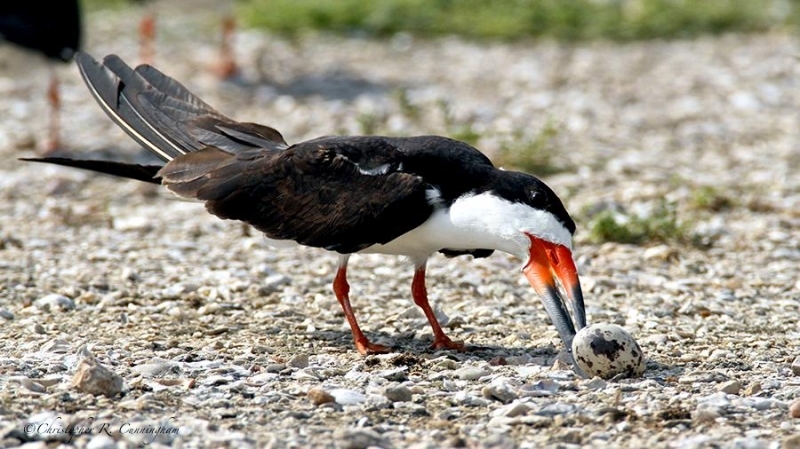 Posturing includes head tossing, standing upright and sometimes opening the beak without making sounds. 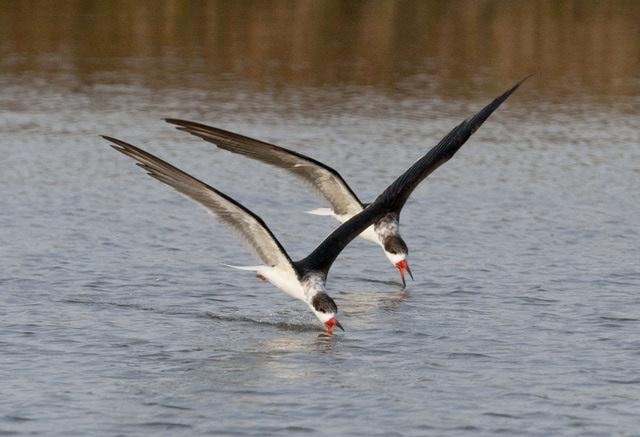 They preen & clean themselves in fresh water. 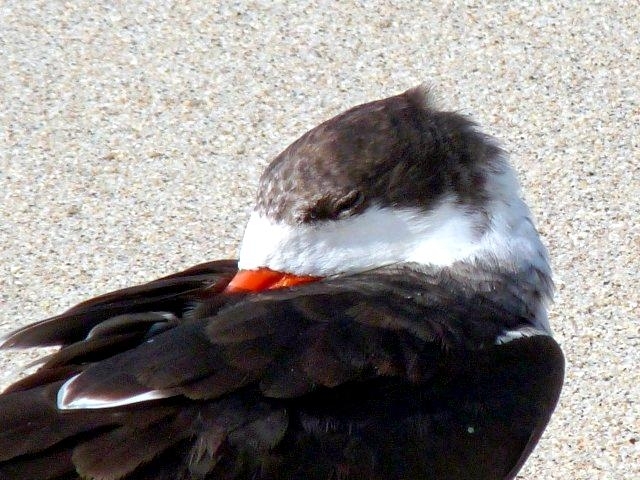 When they sleep, they tuck their heads into the wing feathers on their backs. 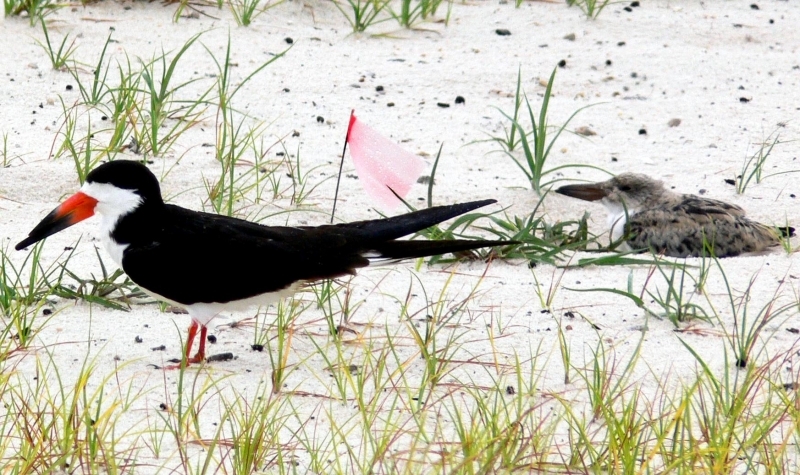 During courting, the male presents the female with a fish. 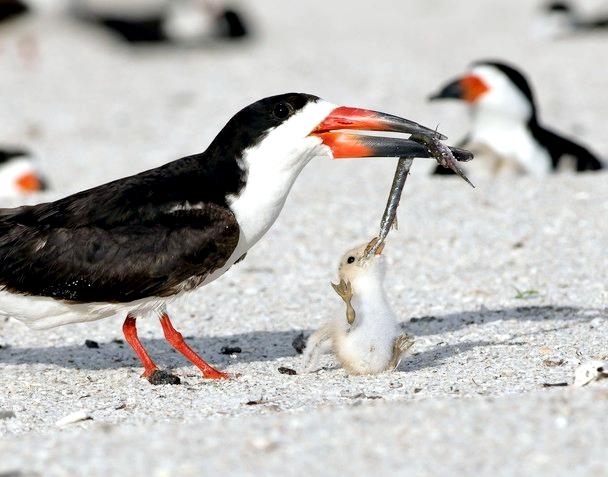 After she accepts the fish, she holds the fish in her mouth until copulation takes place and then swallows the fish. 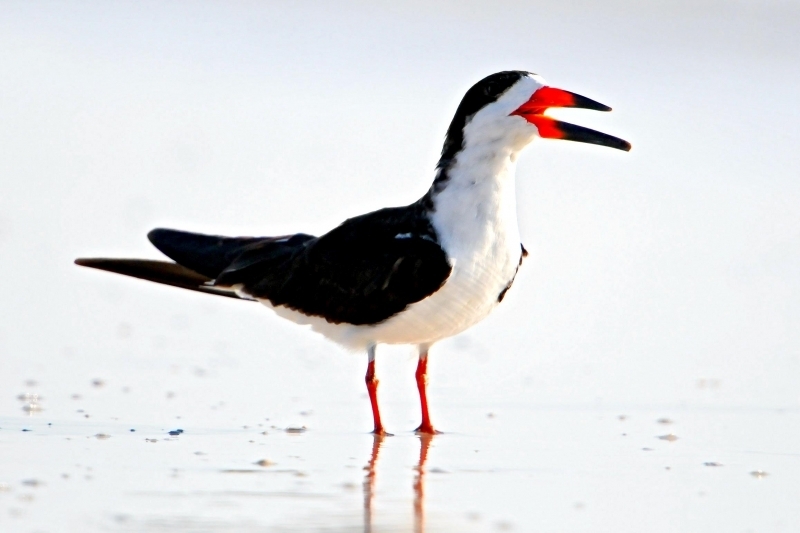 The Black Skimmer breeds in colonies on sandbars and beaches of large rivers. 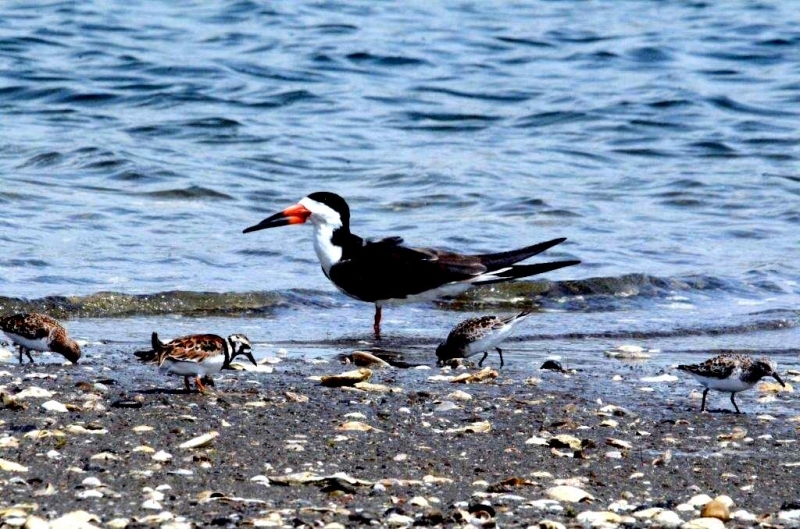 They tend to nest near other terns. 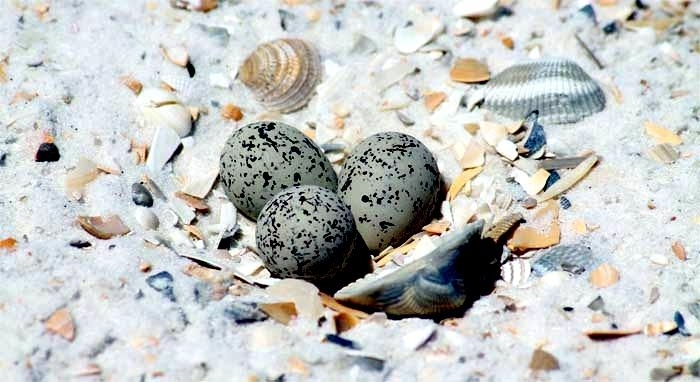 The nest is a scrape in the sand. 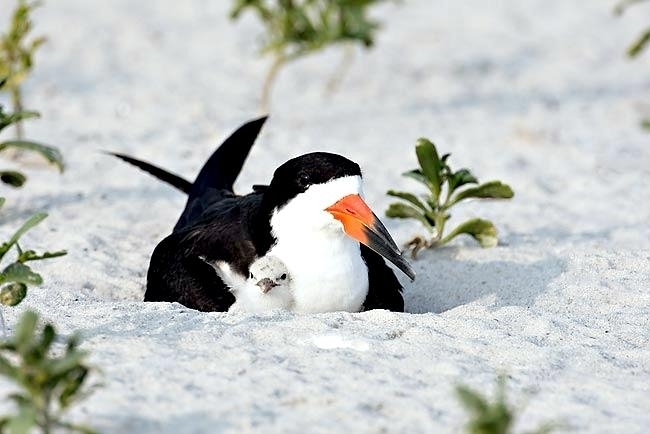 The pair takes turns scraping the nest, using both feet to kick the sand vigorously backward. 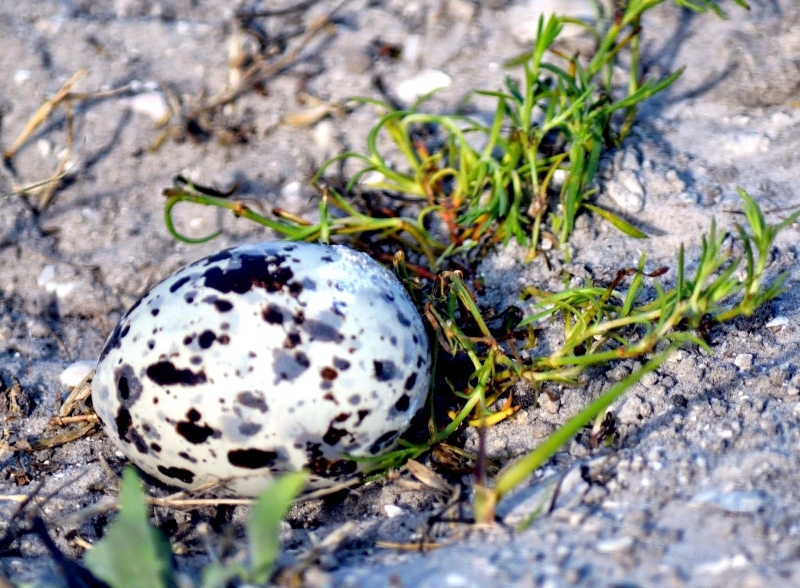 The female lays 3-7 eggs directly on the sand, no nesting materials are added to the nest. 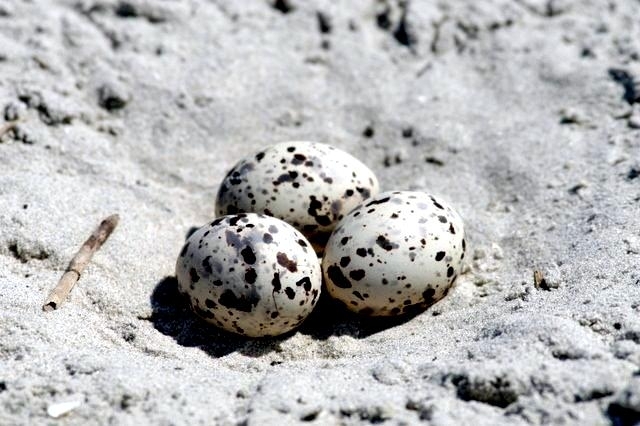 Incubating the eggs lasts from 21 to 23 days and is done by both parents. 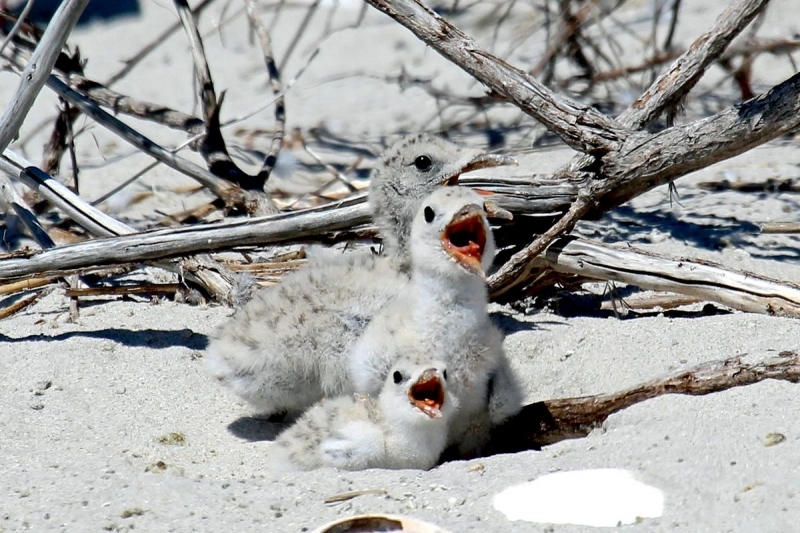 They defend the nest by “barking” & posturing. 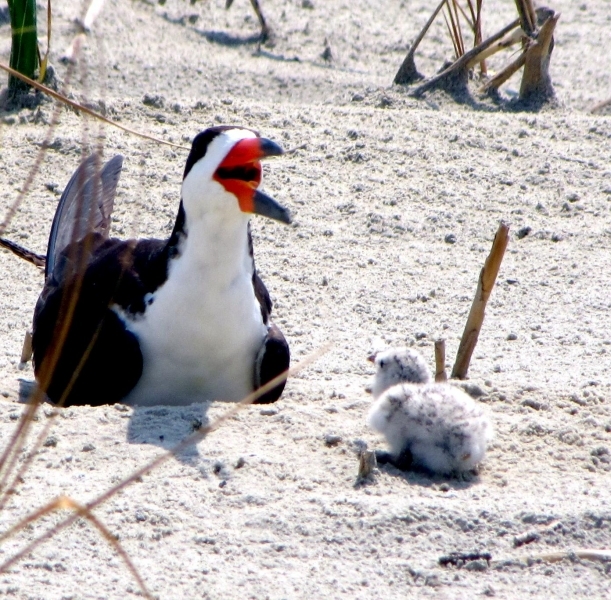 The parents feed the chicks by regurgitation or by dropping food on the ground. 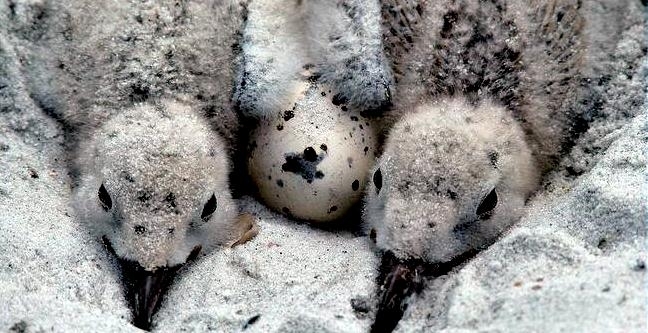 The chicks are able to pick up food on the ground because when they hatch their lower beak is the same length as the upper one. 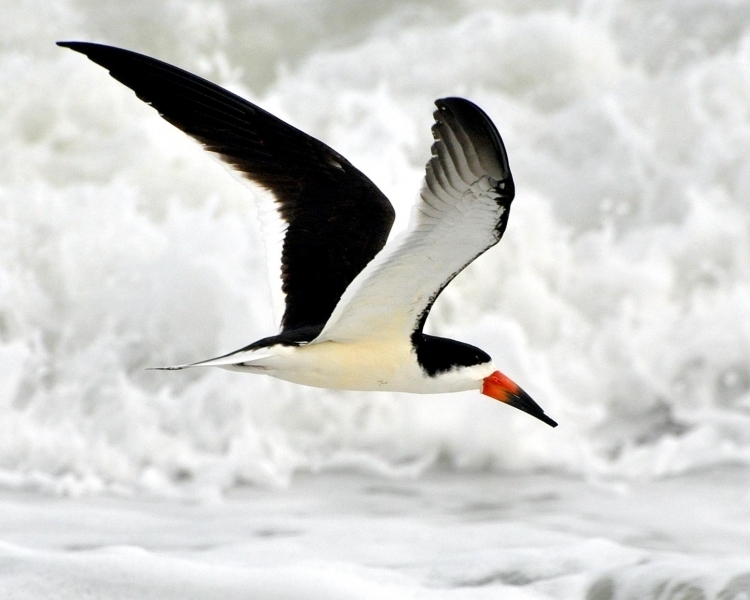 This will change at around one month the lower is beak becomes longer than the upper. 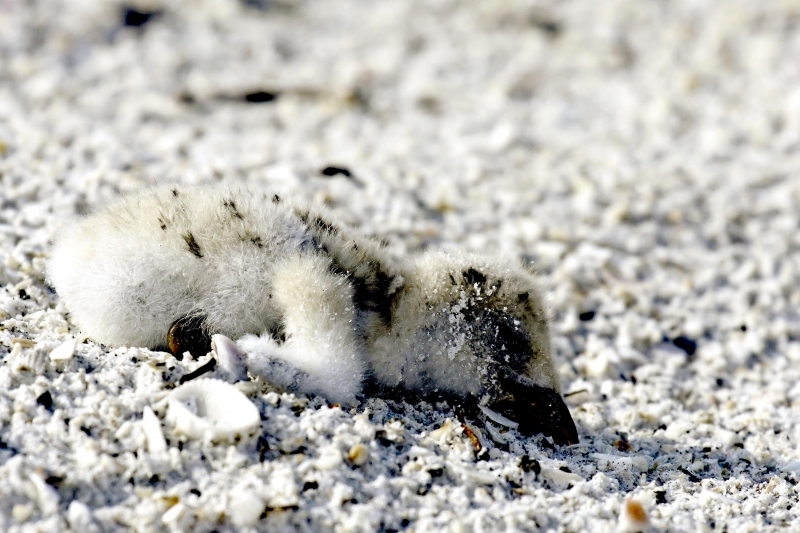 When chicks begin to leave the nest, they may hide from predators by scraping a depression in the sand and kicking up sand to cover up. 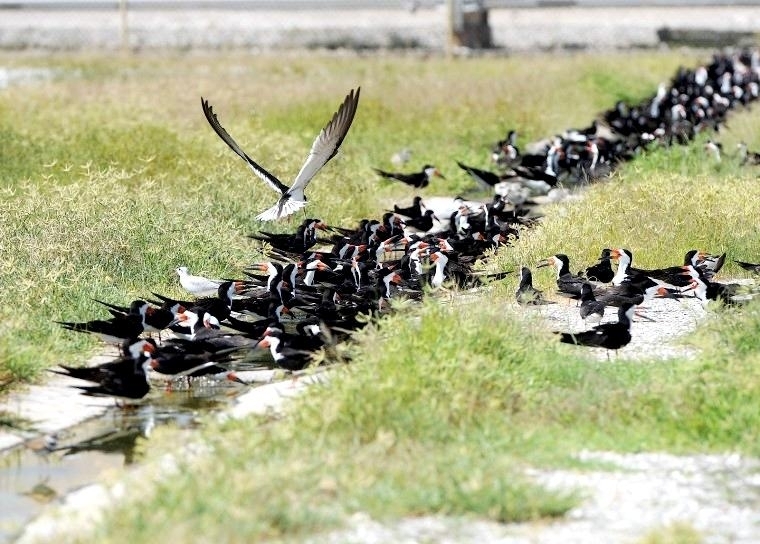 They will also do this to cool off on hot days. 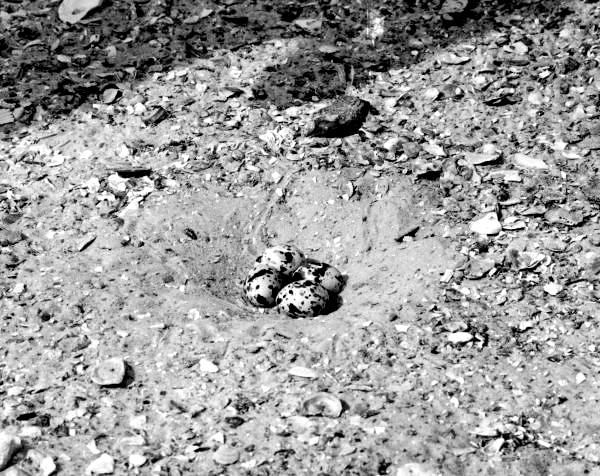 The Black Skimmer chicks fledge in about 24 days.